Beginning in 2010 Hall-Dall Middle School 7th grade students joined community members to form the Historic Hallowell team. As part of the Maine Heritage Community Grant, the team began the journey of writing a web-based history for the city of Hallowell. Student researchers worked hard to contribute pages to the Historic Hallowell website. They dug into primary and secondary sources to create the exhibit Disasters - Natural and Man-made.. 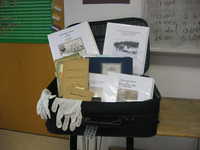 In 2010-2011 school year eighty Hall-Dale Middle School students have again spent time delving into Hallowell's past. This year students created several new exhibits. Protect and Serve , a history of Hallowell's Police and Fire Departments, Industry on the Bombahook and Commerce on the Kennebec describing some of the happenings along the riverfront and related topics. 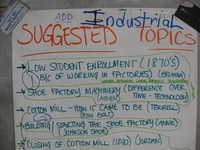 Students also contributed new segments to many other exhibits including The Cotton Mill, Johnson Shoe Factory as well as some history about the Vaughan Stream. The school year began with students taking a field trip in the fall to visit downtown Hallowell. 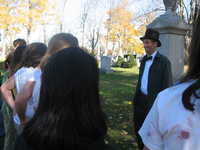 They first participated in a scavenger hunt looking for artifacts found in the Hubbard Free Library, next on to the cemetery where they were greeted by Sam Webber in his top hat, and last a tour of Hallowell's Museum in the Streets annotated by another Historical Hallowell team member, Gerry Mahoney. Lunch took place in our historic City Hall. 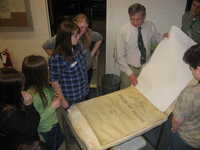 During the winter they visited the Maine State Museum and the Archives to further their understanding of how history is saved and recorded. Back in the classroom, the next step was to examine the primary and secondary source material found in The Black Suitcase. Mr. Webber, City Historian and former Hall-Dale history teacher, painstakingly gathered Hallowell resources and put them together into notebooks related to topics being researched. He spent countless hours working with students in the classroom throughout the project. This year's plethora of information included maps, a ships manifest, newspaper articles, history of the Vaughan Woods and Homestead, annual reports, diaries, and many historic books. Students emailed Mr. Webber constantly during this research time to ask for specific facts or a picture to go with their topic. 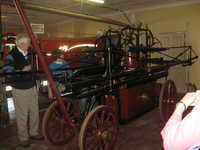 Captain Arthur Moore came to school and gave interviews which can be found in the Commerce on the Kennebec exhibit. Students examined the material and broke it down into topics to be researched, created a working groups, and began to put together an idea for their exhibit page. Once they had some information they began writing narrative during Ms. Raymond's language arts class. The search for pictures that would relate to their topic came next. The primary source images had to be searched and sorted from various sources, scanned, up loaded and cataloged before they were ready to use. The most challenging part of the project was editing the narratives to ensure the information was historically accurate and coordinated with the project group. However, students persevered and continued to work together to make their projects exhibit ready. 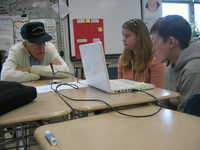 Historic Hallowell team members Lisa Leahy and Bob McIntire each spent a day working with students to demonstrate how to make a web site and how to make their page interesting and appealing. The Hallowell Community team and the Hall-Dale Middle School students worked together to accomplish this year's new Hallowell History on Maine Memory.